Perhaps the most famous horror film and the most famous sci-fi flick at the same time, Alien is less a movie and more a national treasure. Imagine if it was eliminated from the cinematic vaults, if it had never existed, if it hadn’t laid the groundwork for all future space adventure films. Now, that’s not to dismiss those that came previously, those classic films and those b-movies that went where no man had gone before and on which much of Alien is based. 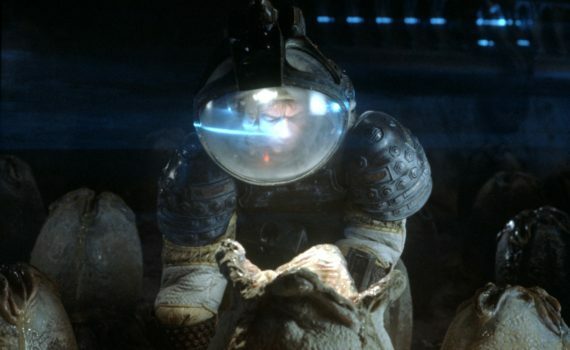 But Ridley Scott was able to make a near-perfect horror drama after drawing on those inspirations, and unknowingly start an action franchise that would last 40 years, so far. Think of all the genres this film touches, think of all the stories that have followed in its wake, and think of how it will still be remembered in another half a century. The crew of the Nostromo, a commercial spaceship bringing ore back from the far reaches, is awoken from their collective cryogenic sleep when the computer picks up a distress call from a nearby planet. With orders to investigate, three of the crew, led by Dallas, walk the surface of the stormy planet to an abandoned craft. There they find their doom, it just takes a little time to kill them. When Kane is attacked by a parasitic space bug, he’s brought on board the Nostromo with the thing attached to his face. Two factions form: one against the breaking of quarantine, led by Ripley, and one for the scientific study of the creature, led by Ash. Ripley’s fears are soon realized as the alien thing does its work, endangers the entire crew, and seems indestructible, putting the lives of every human in the galaxy at fantastic risk. I read once that modern films are simply doing too much, that Alien is one of the best movies ever made and literally only four things happen. That made me laugh, but it’s also basically true. Find a creature, attacked by the creature, and fight the creature, with one stellar curveball thrown in to ignite the imaginations of generations, which led to a franchise that is still alive & well. The beginning of the film pulls from 2001: A Space Odyssey quite a lot, but in homage, not in theft. Then, when things go downhill for our heroes, the story is pure horror, with the alien roaming the ship and hunting around every corner. It’s such a simple and scary concept, one fueled by a quality cast and a good script, nothing else fancy required. Sure, it may be Weaver’s only good performance other than Aliens and Finding Dory, but she and the rest of the team are enough to help make this movie a classic that will live forever, and deservedly so.